Marketers Weigh In: Instagram or Snapchat Stories? Be honest: Do you spend a lot of time during your work day chatting with colleagues on messaging apps, like Slack? It's okay -- so do we. 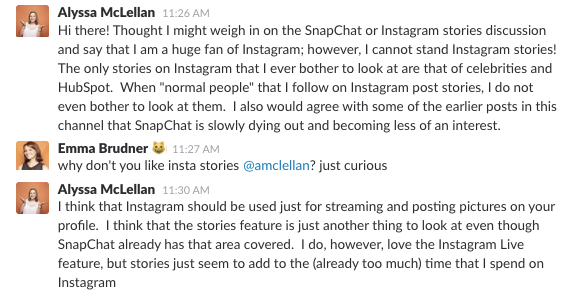 And while some of our messages are GIFs and emojis (okay, the majority of our messages), we also get into lots of lively Slack discussions (okay, debates) about news stories and product announcements in the marketing technology space. 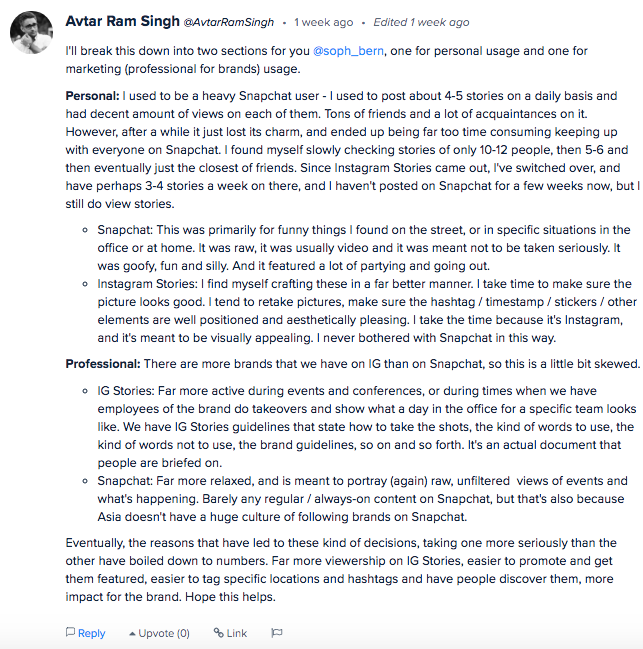 So when my colleague, senior growth marketing manager Niti Shah, sent around a link to Apptopia's analysis of Snapchat's slowing user growth, it sparked a discussion of who uses which app for sharing disappearing messages, and which is better -- Snapchat Stories, or Instagram Stories. The conversation evolved from there, so we wanted to open it up to our inbound.org community members, too. When do you prefer to use Snapchat, and when do you prefer Instagram for Stories? When do you use Snapchat vs. Instagram for different marketing purposes? And now, we're sharing some of marketers' biggest reasons for why they prefer each platform -- read on for some of the highlights of the debate below. 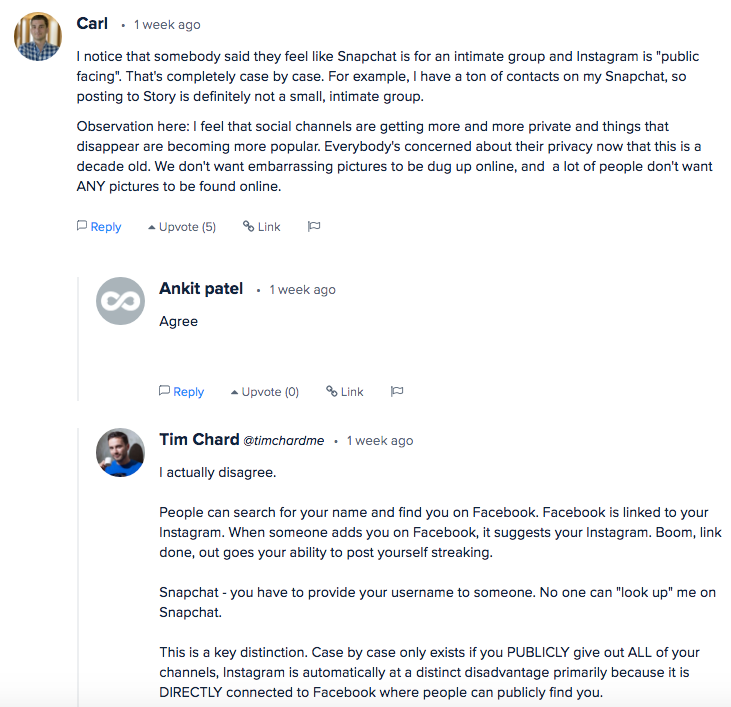 The most resounding point that came up again and again -- on both inbound.org and on Slack -- was Instagram's size advantage: While Snapchat hit 166 million users earlier this year, Instagram Stories alone has already racked up an impressive 250 million users. And that's probably because any one of Instagram's 700 million total users can click on Stories to start seeing ephemeral content from accounts they follow. 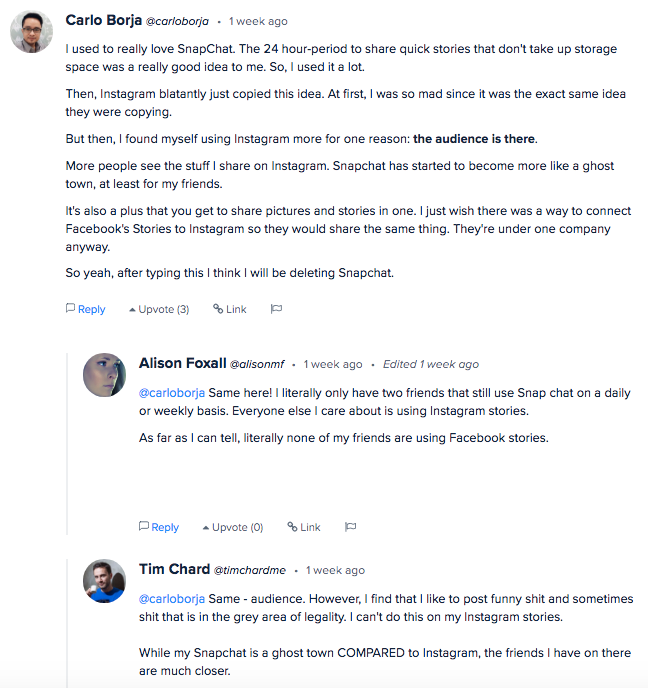 So it's no surprise that marketers at HubSpot and on inbound.org saw the advantages of leveraging their reach with existing audiences on Instagram to share ephemeral content. Marketers found that Instagram Stories achieved higher levels of engagement than Snapchat Stories, so their sharing habits have dwindled on Snapchat -- and in some cases, dropped off significantly. Some even went so far as to delete Snapchat from their devices altogether. 2) It's is easier for individuals and businesses to use. Because Instagram has been around slightly longer than Snapchat, users were already familiar with the interface when Instagram Stories was unveiled last August. So it's no surprise so many members of our community found it easier to use compared to Snapchat. Benjamin Choy cited Instagram's business tools, which are managed through Facebook's impressive ads manager, as another compelling reason for marketers to spend more time and effort on Instagram. 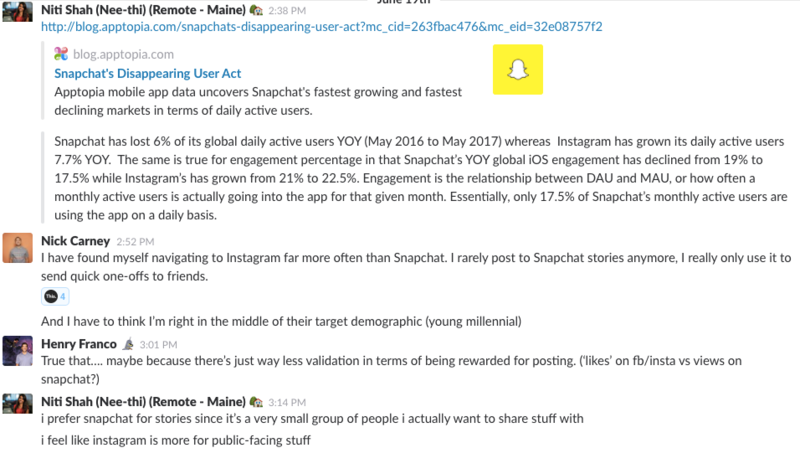 A couple of my colleagues cited the ease of permanent and Stories sharing all in one app, and my colleague, growth marketing manager David Ly Khim, made a great point about Instagram's messaging capabilities compared to Snapchat: Individual direct messages don't disappear, as they do on Snapchat. Others were more blunt about their opinions of Snapchat's usability -- or lack thereof. 3) It's more visual for retailers on the platform. 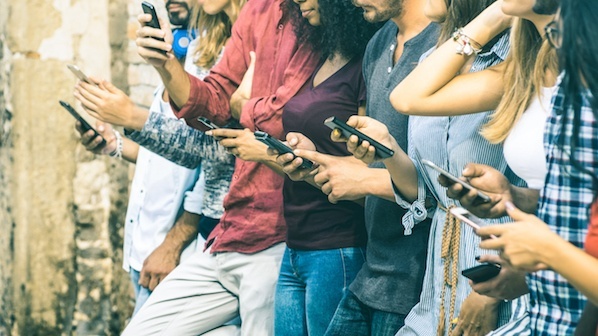 Because Instagram is such a visual platform, some marketers have found their audience members and customers to be more engaged than on Snapchat -- especially when it comes to sharing (or re-gramming) pictures of products. 4) The audience is already there. Like we mentioned earlier, because so many millions of users were already on Instagram when it introduced the Stories feature, many marketers find it easier to share content on the platform they were already using to share photos and videos. The built-in audience makes it easy for some marketers to prioritize the platform over Snapchat. 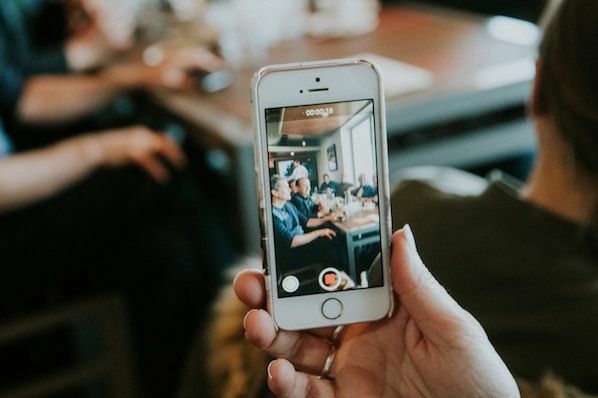 Instead of rebuilding an existing audience of users, they can activate existing fans and attract new ones by sharing different types of content on Instagram. But one Instagram fan only likes Instagram -- and not Stories. 1) Users can share spontaneous, unpolished posts. 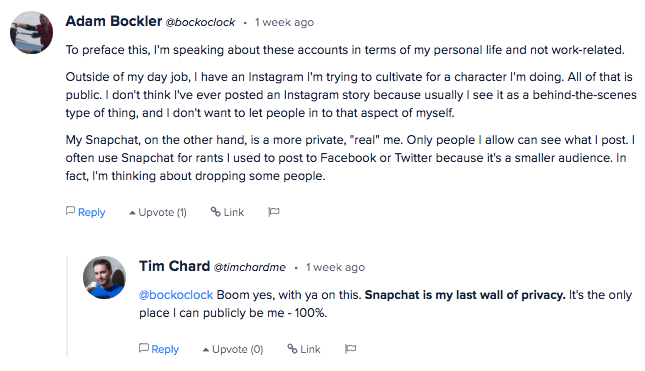 Snapchat was the original ephemeral sharing and messaging app, and it made its mark for showing a more authentic and unpolished side of social media, especially compared to the perfectly curated posts on Instagram feeds. And as it turns out, that original feeling is what keeps some of its users engaged to this day. 2) It's a less competitive space for brands to stand out with customers. 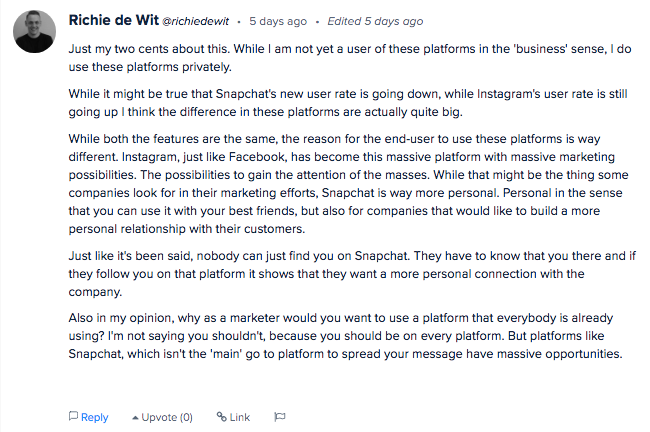 While some think Snapchat makes it too hard to discover and follow other users, Richie de Wit thinks Snapchat audiences could be more engaged because they have to seek your brand out so intentionally. Plus, because Instagram is so saturated with accounts, Snapchat could be a way to grab people's attention more easily. 3) It's a more personal, private space for sharing with friends. The most commonly cited argument for using Snapchat was for private use to communicate with friends and family -- not necessarily for brands. 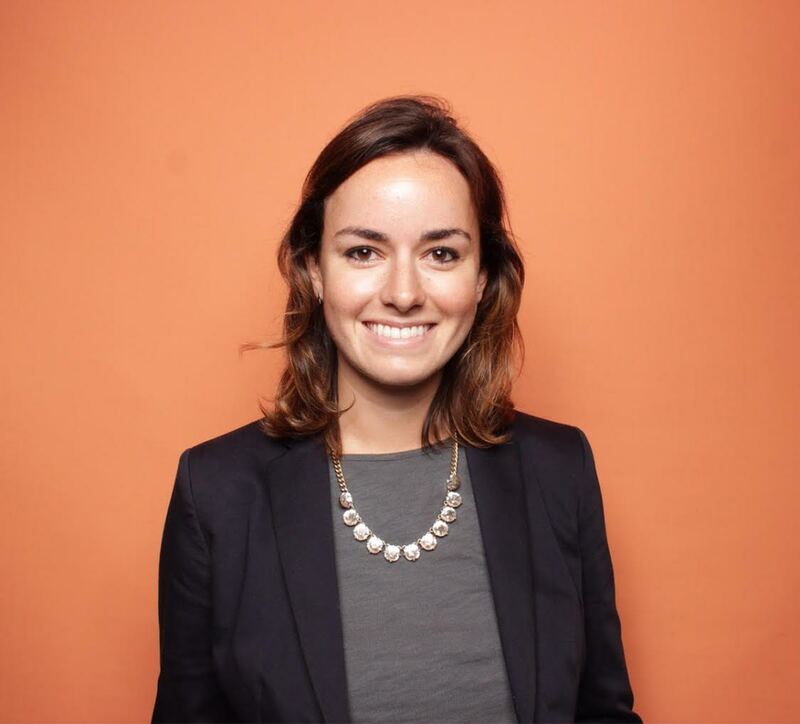 My colleague, senior growth and acquisition marketer Lindsay Kolowich, uses Instagram for personal branding -- and she doesn't post Stories. Instead, she saves her authentic and spontaneous content for her private network of Snapchat friends. And in such a connected and social world online, some marketers find it valuable to have one network that's just for them, and not for personal or business branding. 4) It's popular among younger audiences. One of Snapchat's biggest value propositions has always been its appeal to younger social media users -- like teens in high school, and college students in their early 20s. Younger millennials were among the early Snapchat adopters, and they're still the Snapchat diehards today. So it's no surprise that when we asked our resident youth culture expert, Clifford Chi, about Snapchat, he was a big fan. So while Snapchat might be on a user growth downturn right now, who's to say how its demographics and popularity will change when Chi and his classmates graduate, start working in social media marketing, or purchasing ad space? They'll probably start with Snapchat -- and app they already know and love. Why Use Instagram and Snapchat Stories? 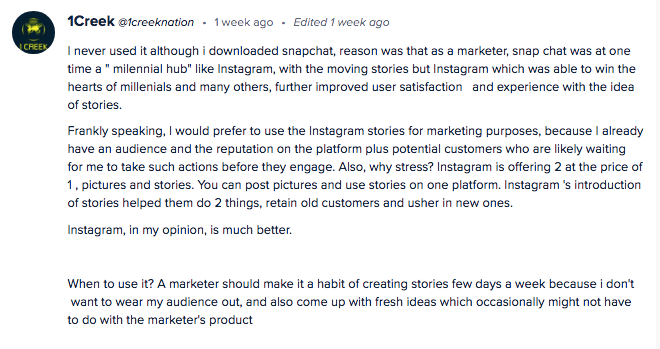 This is only a sampling of a couple of discussions, but the vast majority of people I asked chose Instagram Stories for marketing and Snapchat Stories for personal sharing. So, does that mean that Snapchat is out, and Instagram is in? Not so fast. Marketers should always seek to meet their audience where they already are -- and not recreate them on a different platform just for the sake of it. If you're engaging with your audience and your customers on Snapchat, don't stop simply because Instagram might be more popular. Both networks are constantly innovating (and copying each other) to offer more business tools to make products more competitive -- so stay tuned for our coverage of social media news every month to see how Snapchat and Instagram stack up against each other. Many thanks to the HubSpot employees and inbound.org community members who participated in this discussion. Where do you stand on the debate over Instagram versus Snapchat for ephemeral content? Share your opinion with us in the comments below.